Let Me Ask. . .
and I’ll teach you exactly how to do this. 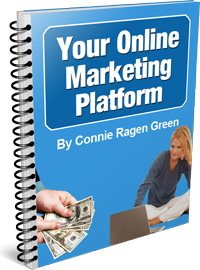 You may be asking “What is an online marketing platform?” What I am referring to is the way you establish yourself when you make the decision to become an online entrepreneur. My name is Connie Ragen Green, and I’ve been online since 2006. People tell me that I’m ‘everywhere’ online, and that’s no accident. I want to share with you how I have been able to go from relative obscurity to having more than a half million results when you Google my name, in less than 5 years. Enter your first name and primary email address in the form on your right, and you’ll receive your Special Report in your email inbox in just minutes. You can be on your way to a profitable online business today.